IDEA OSG 1 is the In-Situ Debris Environmental Awareness OSG 1 satellite – a 22-Kilogram Microsatellite outfitted to study the micro-debris population in the Low Earth Orbit regime to better understand the dangers associated with small debris pieces ranging from 0.1 to several millimeters in size which can inflict lethal damage to satellites. At present, knowledge on the distribution and population of these small debris sizes is incomplete with a strong desire to create a micro-debris environmental model to identify orbital regimes that have lower debris populations and inform satellite designs to minimize collision damage. The IDEA-OSG satellite was developed and built by Astroscale, Singapore based on a concept from Kyushu University, Japan. It is the first microsatellite with the sole objective of tracking and mapping of micro-debris in Low Earth Orbit, aiming to deliver a comprehensive debris distribution model and helping future space missions assess the collision risk for various orbital regimes with respect to the total population of debris and their size distribution. The existing data on sub-millimeter debris comes from surface analysis on returned spacecraft such as returning Space Shuttles after mission durations of around two weeks, exposure experiments run at the International Space Station and NASA’s Long Duration Exposure Facility that spent nearly six years in orbit between 1984 and 1990. However, this data has been of limited use since the Space Shuttles only flew in a narrow orbital regime and samples returned from ISS show the total accumulated micro-debris strikes over missions of months to years which reduces the accuracy of time and location of debris populations. Estimates for the micro-debris population predict approximately 150 million debris pieces larger than one millimeter in orbits between 400 and 1,000 Kilometers, capable of striking orbiting satellites with a relative velocities up to 20 Kilometers per second, depending on the collision geometry. At these speeds, even a millimeter-sized particle can pack a fatal punch. 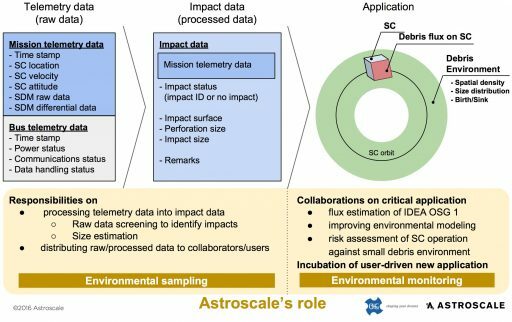 A continuous sampling capability is considered critical when attempting to understand the dynamic evolution of the LEO debris environment. 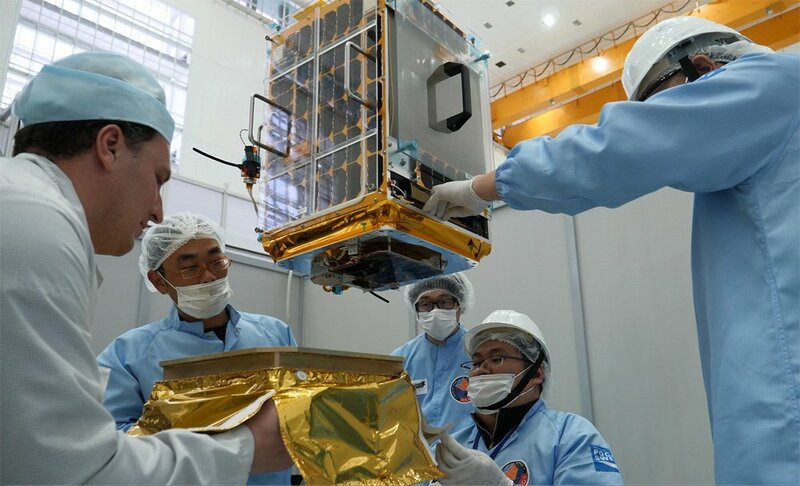 MicroSatellites may be the key to obtaining representative micro-debris data since they can access space frequently, operate in different orbits and have low manufacturing and launch cost. 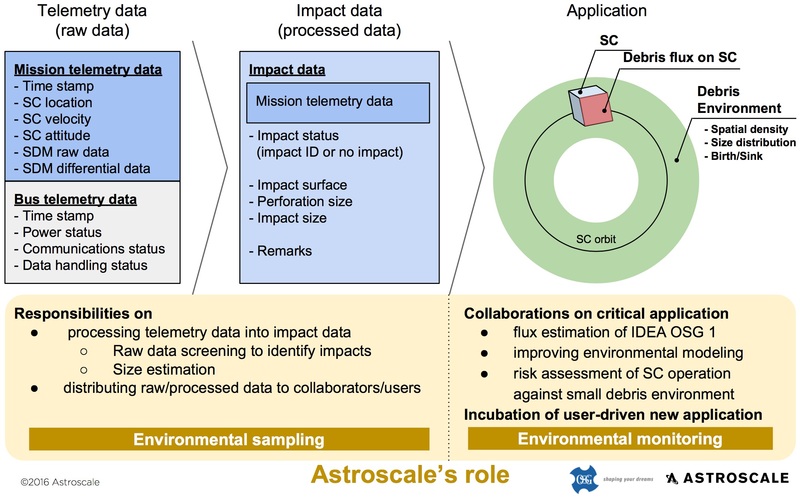 The IDEA project has the ultimate goal of establishing a constellation of microsatellites outfitted with in-situ debris detectors to deliver spatially and temporally relevant data. 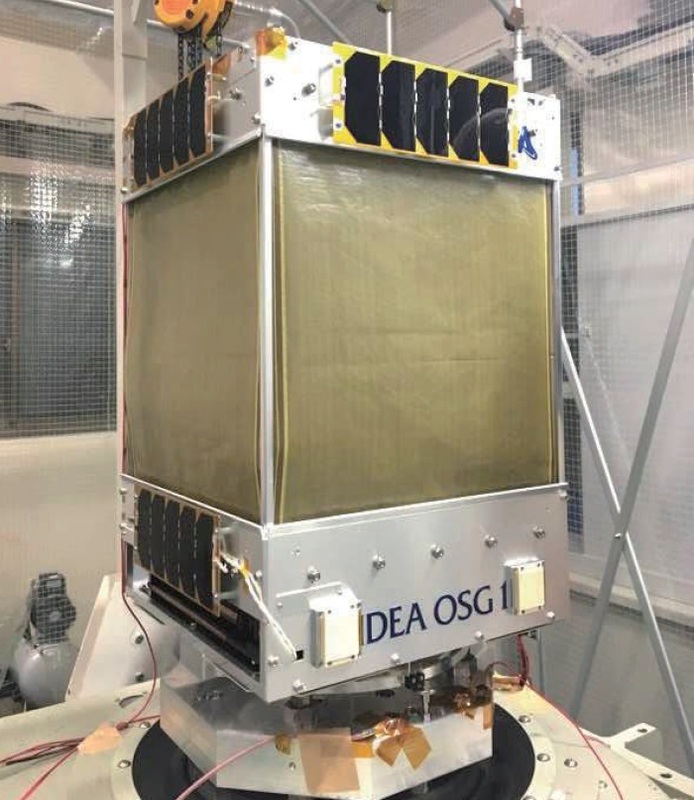 As the first satellite of the project, IDEA OSG 1 will be placed into an elliptical orbit varying between 600 and 800 Kilometers in altitude, covering a vital orbital regime that is used by meteorological satellites and has been hit by a number of debris-generating events in recent years. 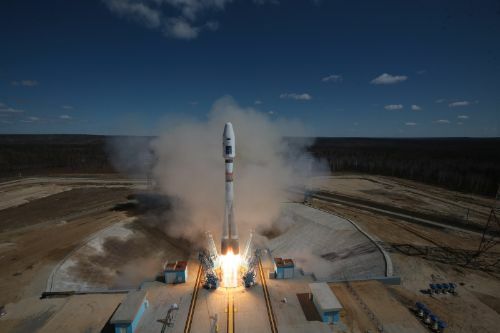 The 40 x 40 x 60-centimeter satellite will operate for at least two years after launch and, through its non-synchronous orbit, will be able to collect a three-dimensional debris population map for the altitudes its orbit intersects. The IDEA OSG 1 satellite uses a three-axis stabilized platform, hosting a pair of Space Debris Monitors as primary payloads, a DeOrbiting Device and auxiliary equipment such as an Information Mix Camera and GPS receivers and processors to deliver timing and location data for each debris strike. 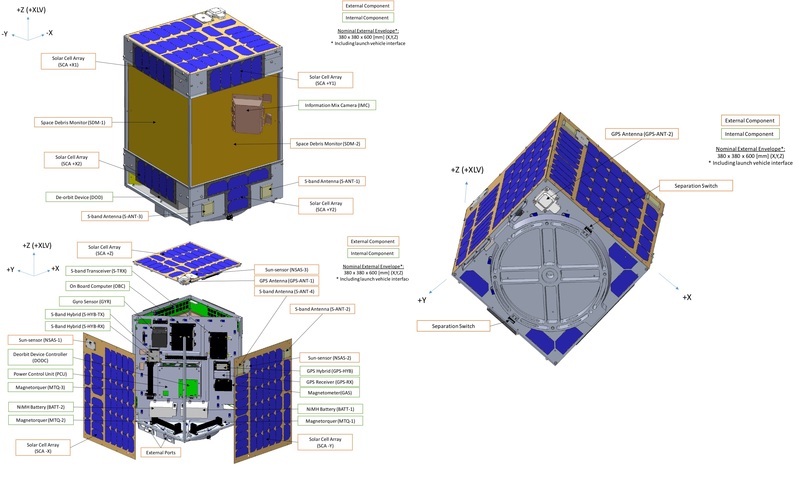 The box-shaped satellite body is divided in two by a diagonal panel. The two Space Debris Monitors reside on the +X and +Y sides of the spacecraft, taking up the majority of two side panels; the satellite bus equipment resides in the compartment without the SDMs. In the space on the same side as the SDMs resides the Information Mix Camera and payload electronics. The Electrical Power System consists of body-mounted solar cells occupying two of the satellite’s side panels, the +Z top panel plus smaller panels taking up free space on the aft satellite panel and the two side panels hosting the SDMs. In total, the Gallium-Arsenide Solar Arrays of the satellite deliver 30 Watts of power, directed to a central Power Control Unit that distributes power to the various satellite subsystems and controls the state of charge of a 10 Amp-hour NiMH battery assembly. 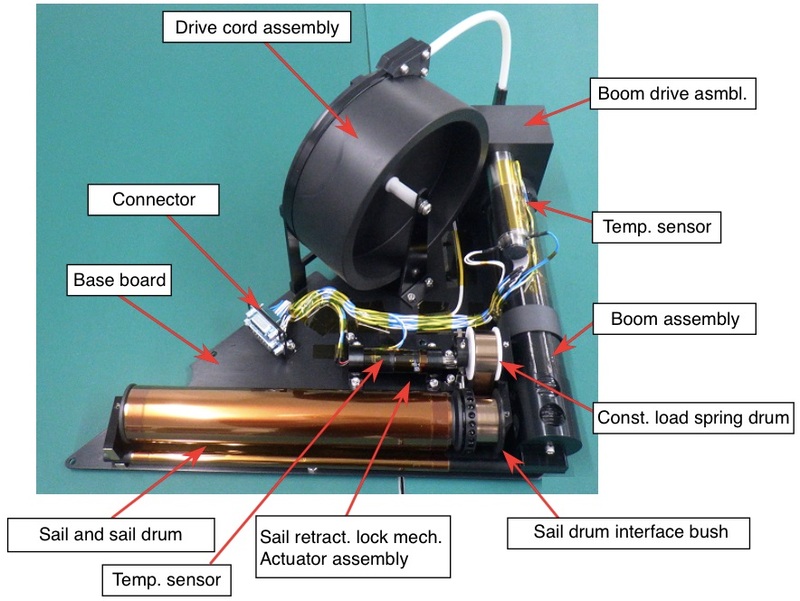 The Attitude Determination and Control System uses sun sensors, magnetometers and micro-electromechanical gyros as sensors and magnetic-torquers as actuators to keep the satellite in a defined attitude in order to measure the direction of incoming micro-debris. 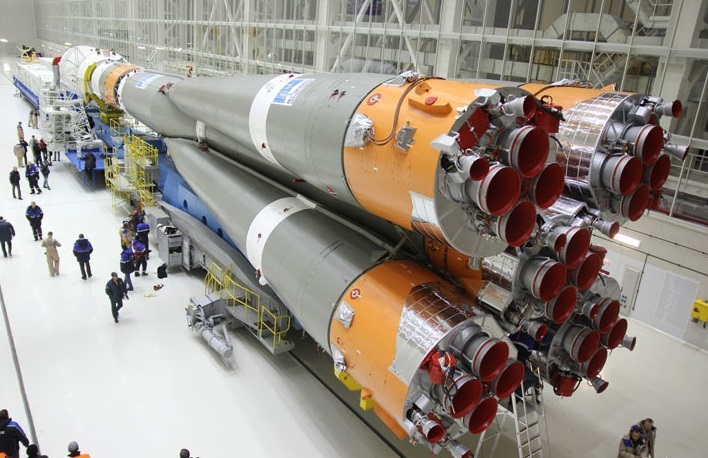 The GPS receivers on IDEA OSG 1 are responsible for delivering time synchronization for the various satellite systems, orbit determination and precise time and position tagging of debris event records. Internally, IDEA OSG 1 uses an SH4 bus onboard controller and Field-Programmable Gate Arrays form the internal data interfaces, S-Band is used for telemetry and science data downlink at a data rate of 64 kbit/s. The Space Debris Monitors (SDMs) of the IDEA OSG 1 satellite use a well-proven design – essentially comprising a large number of fine wires at specific spacing which, when struck by micro-debris, will be severed, causing a loss of conductivity of one or more wires depending on the size of the debris particle. SDM is suitable for debris particles from around 100 µm to over 1 mm. 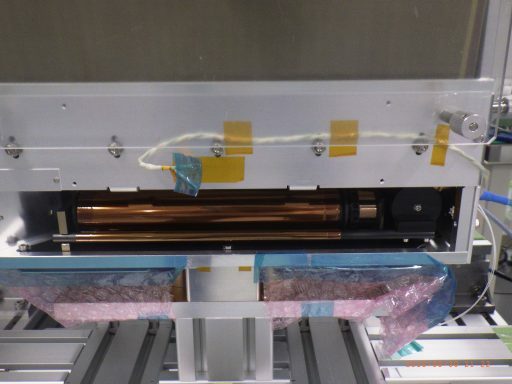 In total, each SDM consists of 3,300 conductive stripes of Nickel-Gold coated Copper material, 50 µm wide and spaced 100 µm between adjacent stripes. The stripes reside on a non-conductive polyamide thin film material around 12.5µm in thickness. The total detection area for each SDM is 30 by 35 centimeters, 0.105 square meters. A dust or debris particle is sensed by a loss of conductivity when one or more stripes are severed by perforation. The data stream from each SDM unit comprises 3,300 bits, one for each stripe with a 0 for each band that is dead (non-conductive) and a 1 for lines that are intact. Mission data collected by IDEA OSG 1 comprises the raw SDM data (3,300 bits for each) and SDM differential data including the number of severed lines measured since the last sampling (providing a an instant indication on whether new impacts had occurred). Additionally, the satellite logs spacecraft location, velocity and orientation as auxiliary data to put SDM data into context. Typically, data downlinked on every ground station pass includes the SDM differential data and auxiliary data records plus housekeeping telemetry; only if an event is evident in the differential data will the raw data be downlinked as well. 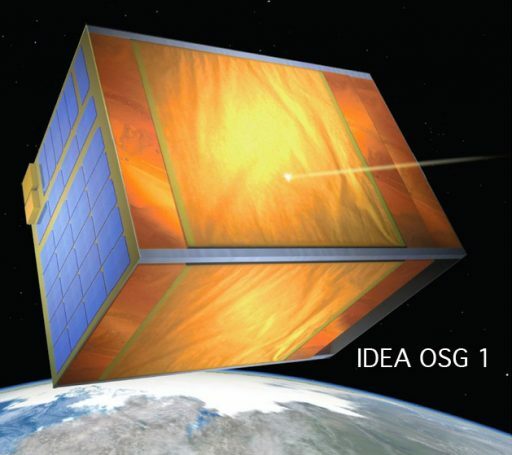 In order not to contribute to the space debris problem, IDEA OSG 1 hosts a DeOrbiting Device – a deployable and retractable sail that doubles as a de-orbiting device and a collision avoidance system. The sail, when deployed, is 0.2 meters wide and 3.0 meters long, supported by a boom and driven by a boom drive assembly that deploys and stows the sail, also capable of setting different deployment states to modify the satellite’s drag rate as desired for collision avoidance. The device will undergo testing at the start of the deorbiting phase, transitioning between a deployed and non-deployed state for one month before permanently deploying to remove the satellite from orbit within 25 years.